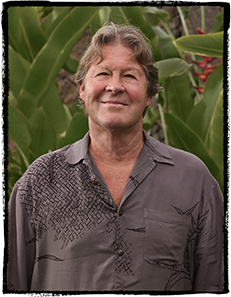 Gary Eoff has resided in Kona Hawai‘i since 1981. He works as an artist and craftsman, influenced by our rich Hawaiian culture and traditions. Inspired by the expert craftsmanship, the high level of aesthetics and the natural materials used in the culture of old Hawai‘i, Gary's work is noted for its attention to detail, it's authentic designs and use of traditional materials and processes. Gary gathers his materials in a manner that sustains the forest: always careful to nurture the plants and help them to reproduce more than was taken. He exhibits extensively, focusing on provisioning the canoe for blue water voyaging and demonstrating the close connections between cultural practices and protecting our natural resources. His traditional and contemporary items are frequently used in exhibits, and he often demonstrates his processes at those exhibits and in other educational settings. we protect the land and ocean resources for our future.